Terrorists who attacked Mumbai did not have enough explosives to blow up the heritage wing of the Taj Hotel in Colaba. Some of the people killed by terrorists in Mumbai may have been done to death in the most barbaric fashion - bled to death from slits caused by terrorists on their bodies. While it is clear that the hostages were kept hungry and without water for more than two days, it is also clear that defenceless people were killed in cold blood almost at regular intervals as the operations were going on. Lashkar-e-Toiba, which carried out the most audacious terror strikes in Mumbai, has for the first time used Hindi words while conveying their threat message through media houses. The Indian defence establishment has denied news items regarding deployment of Indian Army at international border with Pakistan. The three-day long terror strike in Mumbai has pushed India to be among the 20 most dangerous places to visit, a British report has said. Heart-rending scenes were witnessed at the funeral of journalist Sabina Sehgal Saikia, who died in the Mumbai terror strikes, as her body was consigned to flames here today. As the country mourns its dead in the terror attacks in Mumbai and governments may announce compensation to the bereaved families, insurance claims may not really be settled easily, thanks to the 'fine print' and in fact, lack of a proper cover against terrorist violence. An anonymous e-mail threatening to blow up the international airport here has prompted authorities to step up security by deploying additional forces inside and outside the facility. Security has been beefed up in coastal towns and ports in the Saurashtra region after terrorists are suspected to have used the Porbandar coastal route to carry out an unprecedented attack in Mumbai. Alarmed by militants storming the CST in Mumbai, the Indian Railways has decided to expedite plans to install hi-tech integrated security system worth Rs 600 crore at more than 100 stations identified as sensitive across the country. Even as the nation is used to seeing P Chidambaram dabbling in finance, a little known fact is that the genial Tamil Nadu politician is considered a “hawk” among police circles. Chidambaram was among the core group of ministers under the then Prime Minister Rajiv Gandhi that drew up the “Punjab plan” in 1988 to tackle militancy in that state. And, looking at the past, it was a success. Chandrayaan-1, the unmanned mission sent by India for exploration of moon, has won a prestigious international award. An out-of-court settlement in a matrimonial dispute would not deter a woman from seeking maintenance from her husband under the Domestic Violence Act, a Delhi court has said. “The mere fact that parties have undertaken not to file any case against each other shall not work as an estoppel against the husband and it shall not debar the woman from claiming maintenance in the trial court,” additional sessions judge Deepak Garg said. Terror strikes in Mumbai have come in the way of IRCTC’s plans to start the country’s first pan-India luxury tourist train service. With the US and European markets facing severe slowdown, India’s handicraft exports have been hit hard resulting in job losses for over 5 lakh workers, industry officials said. The Opposition Shiv Sena and the Bharatiya Janata Party (BJP) in Maharashtra are demanding the resignation of Chief Minister Vilasrao Deshmukh and deputy chief minister R.R. Patil over the terrorist attacks in Mumbai. A local court here has granted conditional bail to Malegaon blast accused Lieutenant Colonel Shrikant Prasad Purohit in fake arms licence case. Campaigning for election to the 40-member Mizoram Assembly ended today, setting the stage for polling on Tuesday when 6,11,124 people will cast their vote. The city of Bikaner is witnessing an interesting battle of the ballot with the young and beautiful princess of this erstwhile state, Siddhi Kumari, fighting the assembly election on the BJP ticket from Bikaner (east) constituency. Election fever is at its peak in the Bikaner district of Rajasthan with just two days left for the campaigning but the voters are disappointed and anguished over the lack of interest shown in this area by actor-turned BJP leader Dharmendra, who is a Lok Sabha member from here. The prestige of former Chief Minister of Haryana and President of the Indian National Lok Dal (INLD) Om Prakash Chautala is at stake in the Nohar assembly constituency of Hanumangarh district in northern Rajasthan, which shares its border with Haryana. It is sops all the way in the BJP election manifesto, released here yesterday for the December 4 Assembly elections. In a last-ditch effort to woo voters, the BJP , already struggling against the strong rebel factor, sought to please all sections of society with freebies especially for women, farmers and poor strata of society. The ordeal for 99 fishermen, released from Pakistani custody, will finally end today, after they are brought back home here by a team from the Gujarat fisheries department. In a move entailing payout of Rs 40-50 crore, Sahara India today said it would pay five times the gross salaries of each martyr to their families for the next ten years, while paying tributes to the security personnel who sacrificed their lives in the Mumbai terror attacks. Terrorists who attacked Mumbai did not have enough explosives to blow up the heritage wing of the Taj Hotel in Colaba. It was the classic architecture of the building that enabled the terrorists to carry on the operation for a longer period than it would have been possible in a modern day building. Director general of the National Security Guards J.K. Dutt shared the experiences of his team on returning back to NSG headquarters at Manesar near Gurgaon. The team of the NSG commandos - all from the special operations groups - also arrived back and were hugged by their mates and congratulated with typical back slapping quotes like “Saabash Sher” ( well done Lion). They shared their tales of raw courage and valour in face of bombs and guns. All commandos, who fought in Mumbai are on deputation from the Indian Army’s front line infantry units. All are highly skilled and work in pairs. Now that the operations are over they will be back training as usual, some of them will complete the tenure and return to their parent regiments of the Army but with memories that they will carry for life. On the operations Dutt said, “I think the terrorists lacked quantity of explosives that would have been needed to blow up a huge building like the Taj. The amount of explosives recovered from them does not indicate that they could bring down the building, he told reporters.He said the classic style of the building created hurdles. The century-old architecture of the building, which has long connecting passages, spiral staircases and rooms with high ceilings, gave enough room for the terrorist to hide. The NSG chief, who is an Indian Police Service officer, said the terrorists were quite conversant with locations and kept moving from one place to another to avoid direct encounter with the commando’. On the other hand, the commandos did not know where one passage would lead thus posing a hurdle in the operations. Dutt said the terrorists preferred big rooms with high ceilings to take positions. They avoided any small rooms or kitchens where the commandos could easily trap them. The team found a spiral staircase. One of the terrorists had taken a position on that to protect them from the rear side. “ We had to keep changing our strategies,” Dutt said. He also lauded efforts of his search teams and the dog squads. During the mopping up operations many unexploded grenades were found. Another tactic was to set the upholstery on fire to distract the commandos so that they could change their positions. The moment a fire was started, fire brigades had to be called in and shooting had to be suspended. As this tactic was revealed, a commando entered one of the rooms despite the fire and shot one of the terrorists who fell out of the window, which was even caught on camera, he said. Meanwhile the NSG chief defended the nine-hour delay in reaching Mumbai. It may be mentioned here the team was taken on board a IL 76 aircraft owned by a leading counter spying agency of the country the same night the attack took place. The IAF aircraft arrived from Chandigarh the next morning. If the panic in the nation was not enough, investigating security agencies, who were collating eye witness accounts of the NSG commandos, say a few of the dead were found chained with cuts on their bodies - bled to death from the wounds afflicted by the terrorists. It is typical of Jihadis to slit the throats, said a senior official. The precise planning was the key to success of the terrorists and they had managed to keep the security forces at bay for such a long time as they had kept hostages with them and used them as human shields. Since the terrorists had only dry fruits with them there was little chance that the hostages got anything to eat for two to three days. Torture was evident, the NSG commandos have told investigators. A hotel guard and a guest were found dead in a room. They had been stripped naked, there were marks of beating, their legs chained and were bled to death from wounds caused by knives. It is still not clear how many were kept hostage, but one thing is clear all were not in the same room. Some hostages were kept together and were moved by the terrorists every time they wanted to move from one floor to another. To distract the commandoes, hand grenades were hurled. Sources said a major part of the damage and torture of the guests was committed within the first few hours. This started as most of the guests hid in their rooms and bathrooms, terrorists stormed into their rooms and shot them dead or blew up the room with bombs. Only a handful of hostages - about 24 - were with the terrorists. The hostages who were with the terrorists were kept in a room and were made to kneel down on the floor at all times. It seems the killings of the last hostages were done in batches - says a couple of them killed every few hours. However, most of the hostages were likely to have been killed on the last day of the operation when the battle was coming to an end. It was only when no more hostages were left to be used as a shield that the commandos began increasing the pressure and began pushing them for an all out assault. Early morning on Saturday, at the Old Taj hotel, the last terrorist was killed in the ensuing exchange. Interestingly, the mail, sent in the name of Deccan Mujahideen, was generated from an e-mail account created in Russia but was used by a computer based in Pakistan, officers investigating the pieces of the November 26 attack said. The author of the mail had used voice recognition software to dictate the mail which would in turn type it in Devnagri font. Officials handling counter-insurgency operations in the country said militants had not only for the first time used Hindi language but also made the mail jump from one server to another in order to hide the identity of the master server. It was false and totally incorrect that the Army or the combat aircraft squadrons were being readied for an attack on any location, said a senior functionary. No unit or formation of the Army had been moved from its existing location, said a senior official in the Armed Forces here. In case of the IAF also no combat aircraft have been added to any of the existing locations. In any case, several frontline bases of the IAF are at Ambala, Halwara, Bathinda, Adampur, Jodhpur, Porbandar and other places. All are located at a flight time of less than 15 minutes from Pakistan. There is no need for any deployment. The Indian Armed Forces were on a general state of alert after the Mumbai attacks, officials said, while explaining that an alert is issued after every major terror strike in the country when various establishments are asked to beef up security. But there were no orders for any troop mobilisation. A section of Pakistan media reported that tension was mounting between New Delhi and Islamabad in the wake of the terrorist strike in Mumbai. The Indian officials, on the other hand, maintained that the general state of alert was also in response to a similar move initiated by Pakistan on its border with India after the Mumbai attacks. India had mobilised its Armed Forces after the attack on the Parliament House in 2001. As the Armed Forces were locked in an eyeball-to-eyeball situation, worldwide concerns about a possible outbreak of war between the two nuclear neighbours raged. Senior Army officers of Bihar Regimental Centre at Danapur Cantonment here fondly remember Major Sandeep Unnikrishnan, a brave heart of the 7th Bihar Regiment, who laid down his life fighting terrorists at the Taj in Mumbai. Recalling his four years of association with Unni, Major R.K. Singh of the 7th Bihar Regiment said he (Unni) was inducted into the Bihar Regiment in June 1999 and since then he had been assigned many jobs at vulnerable places, including Jammu and Kashmir and Indo-Pak border in Rajasthan. But Unni always proved to be an outstanding officer who boosted the morale of his troops during difficult times. Unni had topped the “Ghatak test”, one of the most difficult tests conducted by the Army for its command-level officers, not once but twice. He had also proved exemplary valour and bravery during ‘Operation Parakram’ at Jodhpur. According to Singh, Unni’s passion for bravery made him opt for the NSG commando training and on being selected for it he joined the NSG on a 30-month deputation in 2006. He soon became an instructor at NSG Training Centre at Manesar, Haryana. According to his colleagues, he was not supposed to take part in the NSG operation at Mumbai as he was an instructor. But since he was an experienced officer and one of the best in his group, he was sent to lead the First Reaction Team. Commander of the Bihar Regimental Centre, Brig P.S.Rathi, described Unni as a most disciplined, dedicated and upright officer of the Army and said the country had lost a brave and bright officer. The meeting, a part of the fire-fighting exercise, the government has undertaken since yesterday evening to undo the damage to its image caused by the Mumbai terrorist attack, aimed at sending out a message of the nation standing united in the face of external terrorist threat. But it clearly failed in its objective. After over five years of quibbling over the choice of words or phrases between leaders of the various political parties, no consensus emerged since contrary to expectations, the all-party meeting could not come up with any joint resolution. The senior Congress leader also talked about strengthening the maritime and air security system as well as improved state-centre coordination to prevent any more terrorist incidents. In effect the government seemed to have conceded some of the major demands raised by the Opposition BJP from time to time including “legal framework to fight terror.” This is notwithstanding the fact that both Leader of Opposition L.K. Advani and BJP president Rajnath Singh stayed away from this meet. But critics of the government remained unconvinced. For instance Dinesh Trivedi of the Trinamool Congress said: “You need to implement the recommendations of the Vohra committee. But there was no mention of that in the meeting.” He also claimed that no consensus emerged at this meeting. As for Federal agency and strengthening legal framework is concerned, Trivedi did concede that apart from others the Left raised serious objections to this. The meeting chaired by the Prime Minister was attended by UPA chairperson Sonia Gandhi, Leader of Opposition in the Rajya Sabha Jaswant Singh, accompanied by Vijay Kumar Malhotra, from the Congress there were Pranab Mukherjee, A.K. Anthony, Vyalara Ravi and of course the new Home Minister P Chidambram. Then there was Lalu Prasad, Sharad Pawar, Prakash Karat and Sitaram Yechury from CPM, A.B. Bardhan of CPI, Satish Mishra (BSP), Mulayam Singh Yadav and Amar Singh (SP), Akali Dal leader Sukhbir Singh Badal. There were also leaders of the JD-U, MIM and others present at this meet. Listing India among the world’s 20 most dangerous places after the Mumbai terror strike that claimed close to 200 lives, UK daily The Telegraph said in an online report that the British government was currently advising against all, but essential, travel to Mumbai. India has been listed along side places like Pakistan, Iraq, Afghanistan, Israel and the occupied Palestinian territories, Mexico, Thailand and South Africa in this list. Saikia, who was trapped inside the Taj Mahal Hotel when terrorists attacked the commercial establishment, was found dead yesterday. A large number of people, including journalists, businessmen and others, thronged the Lodhi Road crematorium to pay last respects to the deceased scribe. Consulting editor and resident food critic with Times of India, Saikia was in Mumbai for a wedding reception but returned to her room at the Taj hotel early from the function complaining fatigue. 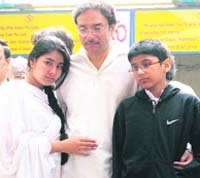 Saikia’s husband Santanu Saikia and their son were inconsolable and seen crying profusely at the cremation which was attended by beauty expert Shahnaz Husain, actor Nandita Das and industrialist and MP Naveen Jindal among others. A 'terrorism insurance cover' is not still present in the country, say experts. "Unlike the US and UK, we don't have any insurance cover against 'terrorist' acts. Loss of life due to terror may fall in the category," says an official of Kotak Life Insurance. Terrorism cover is offered by General insurance companies as an add-on policy with the fire insurance policy. "After 9/11, most companies refused to give cover against acts of terrorism. General insurance companies then formed a pool and since then all premium collections done by the industry for this policy are put into this pool," says Vineet Vidyarthi, principal officer, Almondz Insurance. The information about the e-mail was passed on to higher officials of the CISF, which is handling security at the Indira Gandhi International Airport (IGIA), from Gujarat, CISF sources said today. The airport has been on high alert since terrorists struck Mumbai on Wednesday night killing over 180 people and security was strengthened in the facility by intensifying checking and patrolling. Sources said the CISF deployment inside the airport has been increased after the Mumbai terror attacks while the Delhi police had been roped in to provide more security to the facility. “We have taken adequate precautions after receiving information about an email threatening to blow up the airport. There is nothing to panic. We are leaving nothing to chance. TheBSF, Coast Guard and the local police have intensified joint operations in the sea near Porbander, Jakhau and Koteshwar, according to Porbandar Coast Guard sources. The security agencies are closely monitoring activities of fishermen from the neighbouring country, sources said, adding Indian fishermen were being asked not to venture into the sea. The agencies have also launched searches into whether Indian fishermen who had gone out fishing had returned or not, the sources said. Meanwhile, the Kandla Port Trust (KPT) has also launched patrolling using boats, which have a speed of 30 Nautical Miles, useful in chasing suspicious sea vehicles, the sources said. “We are expediting the process of acquiring sophisticated equipment worth Rs 600 crore to be installed at certain stations identified as sensitive,” a senior RPF official said. The equipment to be purchased as part of the integrated security system include closed circuit televisions (CCTV), personal and baggage screening system, explosive detection and disposal facility at sensitive stations, including Delhi and Mumbai. There are 185 stations identified as sensitive from the security point of view, which include 17 stations in metro cities across the country. Besides, acquiring modern security gadgets the Railways has strengthened deployment of RPF personnel in many stations. “We have deployed about 500 additional RPF personnel in Mumbai alone,” said the official. The Railways would also be acquiring electronic access control system from firms dealing with state-of-the-art security system. Chidambaram was the minister of state for internal security in the ministry of home affairs under Rajiv Gandhi. It was the Home Ministry and this core group of ministers that suggested to have a fence along the border with Pakistan and famously gave DGP Julius Ribeiro and then KPS Gill a “free hand” besides successfully conducting operation black thunder in 1988 at the Golden Temple, Amritsar, to free the religious place of militants. Since he is appointed, this will be the second stint for Chidambaram as a cabinet rank union home minister. He held the same portfolio for a brief period in the United Front-coalition government from 1996 to 1998. Actually Chidambaram was mocked when, 20 years ago, he had claimed “Our Punjab policy will succeed”. Remember the state was burning and entire north India - the granary of the nation - was under the grip of fear. A senior serving IPS officer of the Punjab cadre, who was in Amritsar in those days, today recollected that he had seen Chidambaram personally supervise operation black thunder in 1988. So much so that he was even at the airport receiving forces and talking to young IPS officers and the jawans personally. Years later Chidambaram publicly gave credit to the people of Punjab, KPS Gill and the “brave” Punjab police that stood against terrorism at on enormous human cost, a cost, which is unparalleled in history of any civilian police force. It was Chidambaram and his group that decided to withdraw the paramilitary force and put them on guard duty while giving the Punjab police, the right and the duty to fight terrorists. The action came under criticism and the famous acronym “ bullet for bullet” was coined. Many wanted the Army to be sent in but Rajiv Gandhi and his team including Chidambaram stood its ground. Some time in April 1988, the government adopted a hawkish stance and started to erect a fence at the border with Pakistan. A police officer recollected that questions were asked if the fence was impregnable? Is it a great wall, Is it the iron curtain? Is it such an impregnable fence that nobody will come through? However, Chidambaram stood his ground and carried out the fencing. Today, the fencing has been extended across the entire stretch from Gujarat to Jammu and Kashmir in the north. Unfortunately, one of the controversial decisions taken during that time was the amendment to the law that allowed any person to be held in custody in Punjab without a trial. The amendment to the Terrorist and Disruptive Activities (Prevention) Act enabled the Centre to confer on any civil service officer the powers to arrest, investigate and prosecute. This was grossly misused at the ground level and later the TADA was scrapped. The International Lunar Exploration Working Group (ILEWG) chose the Chandrayaan-1 team for giving the International Cooperation award, M, Annadurai, project director, Chandrayaan-1, said here today. The ILEWG is a public forum sponsored by the world’s space agencies to support international cooperation towards formulating a world strategy for the exploration and utilisation of the moon. The Chandrayaan team of the Indian Space Research Organisation (ISRO) was chosen for the award for accommodation and tests of the most international lunar payload ever (from 20 countries consisting of India, the European Space Agency representing 17 European countries, NASA and Bulgaria) and the successful launch of the probe on PSLV rocket on October 22 and the lunar insertion of the spacecraft carried out subsequently. The other recipients of the ILEWG awards, 2008, in various categories were JAXA Kaguya science team (science award), NASA Constellations and LRO/LCROSS teams (technology award), Dr Clive Neal, lunar scientist from Notre-Dame University (community service award) and Google Lunar X- Prize Competition (commerce award and outreach award). Annadurai said the ISRO team was not having any trouble in coordination with foreign agencies with regards to the operation of various instruments aboard the lunar satellite and in sharing the data being sent by the instruments. Out of 11 scientific instruments onboard the satellite, five are Indian, two built with foreign collaboration and four purely foreign. “Sometimes some of the instruments are frozen and others are turned on. Then those frozen are turned on and the others are made operational”, he said. He said while the Chandrayaan-2 mission, slated for 2011-12, would try to launch a rover on the lunar surface, the objective of Chandrayaan-3 would be to collect samples from lunar surface and bring the samples back to he earth. The court’s observation came on an appeal filed by Sushil, a Ghaziabad resident, against an order of a magisterial court asking him to pay Rs 1,500 monthly to his estranged wife as interim maintenance under the Protection of Women from Domestic Violence Act. Sources in the Indian Railway Catering and Tourism Corporation (IRCTC) said the corporation had planned to sign a joint venture agreement with travel company Cox & Kings on December 3 here to materialise the plan, but the signing ceremony was shelved-off following the terror attack. “The joint venture agreement would have given birth to a new company called the ‘Royale Indian Rail Tours Limited,’ which would have managed and operated the luxury tourist train,” but the terror strikes in Mumbai has led to cancellation of signing of the agreement,” the sources said. The train was expected to be flagged off in the third quarter of 2009. However, the sources expressed confidence that though the plan might be delayed a bit, it will eventually sail through and a fresh date to sign the agreement will be announced later. They claimed, quoting unconfirmed reports that few officials of Cox & Kings might have been confined in the Taj Palace Hotel when the terrorists struck. As per plans, the luxury tourist train, unlike other region-specific trains in the luxury category like ‘Palace on Wheels’ and ‘Fairy Queen,’ will cover tourist spots across the country, providing passengers a glimpse of India in its stately comfort. The initial industrial estimates of handicraft exports show a decline of 30 per cent in the April-October period this fiscal year, an Export Promotional Council for Handicraft (EPCH) official said. Over 1 million people are employed in the most affected handicraft clusters of Moradabad, Jaipur, Saharanpur, Jodhpur and Narsapur (Andhra Pradesh). “Forty per cent exporters have closed down their factories and 50 per cent people in the four most affected clusters have lost their jobs,” All-India Handicraft Board vice-chairman Sudhir Tyagi said. Art metal wares, laces, wooden and wrought iron handicrafts, embroidered and crocheted goods had huge buyers in the US, the UK, Germany, Japan and Middle Eastern nations. According to the EPCH data, handicraft export in April-September this year declined by 22.10 per cent to $1.04 billion, against $1.34 billion in the same period past year. “Export orders have almost frozen,” Tyagi said adding, “December, especially the Christmas season, is very crucial for buyers abroad, the sale during the festival will decide on further export orders.” Last week, Commerce secretary G.K. Pillai said 5 lakh people would lose jobs in the textile sector in the next five months. “Deshmukh and Patil should resign after what happened in the city,” Shiv Sena spokesperson Neelam Gorhe said. “In fact the entire Maharashtra government should resign,” Gorhe added. BJP general secretary Gopinath Munde, however, called for the resignation of Patil since he held the home portfolio in the state. “The law and order machinery has failed in Mumbai,” Munde said in his statement. However, Patil hit back at Munde for asking him to resign. After a meeting with Chief Minister Deshmukh at his official residence, Patil accused the BJP of double standards. “Did Narendra Modi resign as Gujarat Chief Minister when the Akshardham temple was attacked? Did L K Advani resign as union home minister?,” Patil asked. Patil added that the Maharashtra police had performed quite well in the face of terrorist attacks. “Fourteen police officials lost their lives. After the terrorists opened fire at the CST railway station, the police reached the spot within seven minutes,” Patil said. He added that investigators had obtained several important leads during the course of investigating the terror attacks. Meanwhile, nearly 300 persons gathered outside the Taj hotel to condemn the terror attacks. The protesters held placards hitting out at politicians for not doing enough to halt repeated attacks. “Every Indian must be given ‘Z’ grade security,” a placard read. After singing patriotic songs, the protesters hoisted the National Flag outside the Taj hotel. Judge V.V. Joshi granted him conditional bail on Rs 15,000 personal bond, Purohit’s advocate Avinash Bhide said. The Sarkarwada police here registered a fake arms licence case against Purohit on November 15 following a complaint filed by his Pune-based friend Shirish Date. The campaigning till 4 pm today has witnessed absence of street campaigns and ‘pad-yatras’ by the political leaders. The 722-km international border along Bangladesh and Myanmar has been sealed, as also the borders with Manipur, Assam and Tripura. Most of the polling booths in border areas are classified as hypersensitive or sensitive and additional state police personnel were deployed along the borders, especially with Manipur and Assam. Besides, the BSF and the Assam Rifles are manning international borders. State Deputy Inspector-General of Police L Hrangnawn said besides deploying more forces on the border areas, intensive patrolling had been undertaken in the sensitive areas where militants had earlier sneaked into the state. Shedding her royal image, she moves out from the palace on foot in an effort to strike an emotional chord with the common masses. The 35-year-old princess gets up early in the morning, sometimes misses her morning tea, and starts meeting her supporters. What is striking is her unassuming behaviour and simple dressing sense. She speaks the local dialect and reminds the people of the works done by her forefathers for this area. She talks about her grandfather Maharaja Karni Singh and great grandfather Maharaja Ganga Singh and talks about the works done by them for this arid region. While, Maharaja Ganga Singh was the most popular ruler of this erstwhile state, Maharaja Karni Singh was an elected Member of Parliament from 1952 to 1977 in the Lok Sabha. Talking to The Tribune after a public rally addressed by Chief Minister Vasundhara Raje and former Chief Minister of Haryana Om Prakash Chautala here, the princess said she was inspired by her grandfather to join politics and wanted to keep his legacy alive. She said her political guru was Vasundhara Raje. “She has given a lot to Bikaner and now I will share a helping hand for further carrying out more developments in this area,” she said. The resentment among the public is so much that the BJP has also avoided his ‘Basanti’ Hema Malini to campaign in this district even as she has been actively campaigning for her party in the rest of the desert state. Hema is among the star campaigners of the BJP in the state but the betrayal of her ‘Veeru’ with the local populace has kept her away from Bikaner because the policy makers of the party opine that ‘Basanti’ and ‘Veeru’s’ presence here could put an adverse impact of their poll prospects. Local people say that during the last Lok Sabha elections, Sunny Deol and Bobby Deol along with Hema Malini had also aggressively campaigned for their father Dharmendra but they had never turned back to look into the woes of the people. Abhishek Matoria, brother-in-law of Chautala’s youngest son Abhay Chautala is fighting the election on the BJP ticket from here. For the past few days, the Chautala family is camping here in an all-out-effort to woo the voters. In the Rajasthan assembly elections, he has fielded one candidate on the INLD’s symbol in an alliance with the BJP and managed to secure Matoria’s ticket on the BJP symbol. Political observers say that the drum-up support given by Chautala to the BJP in the Jat-dominated constituencies and the way he is canvassing in the desert state has given an impression among the public that he has not yet lost hopes after the bitter defeat in the home state, but is ambitiously eying for a space in national politics. He has so far addressed more than 15 public rallies in Ganganagar, Bikaner and other Jat-dominated districts, besides, the Hanumangarh district. In the Nohar constituency, accompanied by his younger son Abhay, local MLAs of Bahadur Singh Godara, Amar Singh Punia and Kashi Ram Godara, Om Prakash Chautala has addressed many public rallies and nukkar sabhas at Nohar, Phephana and many other villages. The BJP has dropped its outgoing MLA Bahadur Singh Godara this time and with the influence of Chautala family in this area has also managed to keep Godara in the party even as there were some reports at one point of time that Godara may contest the elections as an independent candidate. Apart from having got accommodated their close relative from the BJP in state politics, the INLD has also managed to secure one ticket on its own symbol from the neighbouring Bhadra constituency of this district from where its candidate Bhim Singh Beniwal is contesting the elections with the BJP’s support. During the past 10 years, the Chautala family has not shown any interest in Rajasthan politics owing to their political interests in the neighbouring Haryana state, where they were in power. Nohar is a Jat dominated constituency with more than 40 per cent of Jats mostly farmers living here. Since, the Chautala family has always been a supporter of this community, be it Haryana, Rajasthan or Western Uttar Pradesh, the Chautalas have a considerable mass support in this area. There are 10 candidates in the fray in this constituency. Addressing a series of public rallies in this assembly constituency in favour of BJP candidate Abhishek Matoria this week, Om Prakash Chautala said the Congress had no future in the country. He lashed out at the Congress for the price rise of essential commodities, ignoring the demands of the farming community across the nation and increase in terror attacks during their five years of rule at the Centre. Probably taking a cue from the Punjab politicians, CM Vasundhra Raje announced supply of wheat at Rs 2 per kg to BPL families and Rs 5 per kg to the middle class, 50 per cent subsidy on power supply, pardoning of all taxes levied on farmers, health insurance for the poor and creation of 10 lakh jobs in the next five years. Raje, flanked by Venkiah Naidu, in charge, BJP Rajasthan elections, Smriti Irani, Rajya Sabha MP and popular TV star, and Om Mathur, BJP state president, also announced introduction of a 'ladli' scheme for newborn girls. Under the scheme, the BJP will provide a fixed deposit to every newborn girl, who would get a minimum of Rs 50,000 at 21 years of age. She hoped this would check female foeticide cases and discrimination against women in the state. She reiterated that bank accounts of 50 lakh women would be opened with Rs 1,500 under the Bhamashah scheme. The scheme has already run into controversy with the state high court staying its execution, as it was formulated close to the elections. The BJP would provide free education to girls up to graduation, widow pension is to be increased to Rs 750 per month and compensation of Rs 1 lakh to be awarded at the death of the single earning hand of a family. The BJP has promised to double the number of seats in engineering courses to 50,000 and opening of animation teaching academies in the state. Naidu termed the manifesto as pro-public. "The Congress manifesto has nothing for the commoners. We have catered to all sections of society." Raje claimed the BJP had fulfilled 97 per cent of the promises made in its manifesto in 2003. She said the remaining 3 per cent could not be met due to non- cooperation by the Central Government. "We are backed by our record to say that we would fulfil all the promises made in this manifesto." “We reached Amritsar yesterday night with names and photographs of the released fishermen for verification,” a state fisheries department official said. We will reach Vadodara late tonight along with the fishermen and leave for Veraval tomorrow morning, the official said. Subroto Roy-led Sahara India Pariwar said in a statement that as an expression of its emotional empathy and solidarity, it has decided to pay per month an amount equivalent to five times the gross salaries of the security personnel who sacrificed their lives, for the next 10 years, to their respective families. If their children do not turn 21 after 10 years, the payment shall continue until they reach that age, it added.